L. Valerius Acisculus was one of the moneyers for the year 45 BC. He may later have served as Tribunis Plebis. 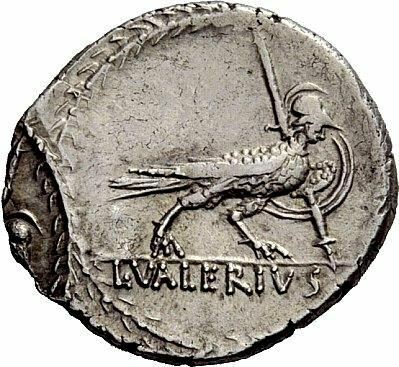 The Gens Valeria was a patrician family at Rome, prominent from the very beginning of the Republic to the latest period of the Empire. Publius Valerius Poplicola was one of the consuls in 509 BC, the year that saw the overthrow of the Tarquins, and the members of his family were among the most celebrated statesmen and generals at the beginning of the Republic. A number of unusual privileges attached to this family, including the right to burial within the city walls, and a special place for its members in the Circus Maximus, where the unique honour of a throne was granted them. The house built by Poplicola at the foot of the Velian Hill was the only one whose doors were permitted to open into the street. Although one of the most noble and illustrious families of the Roman aristocracy, from the very beginning the Valerii were notable for their advocacy of plebeian causes, and many important laws protecting the rights of the plebeians were sponsored by the Valerii. As with many other ancient patrician houses, the family also acquired plebeian branches, which must have been descended either from freedmen of the Valerii, or from members of the family who, for one reason or another, had gone over to the plebeians.